How Do Pests Survive Winter? The short answer is: VERY WELL! Insects have developed many clever ways to service winter, so even though you may not see certain pest now, when the weather starts to warm they're right back again! Many pests that survive the winter outdoors choose a spot where they will be less exposed to the coldest temperatures, and the winds that can dry them out. They might crawl into cracks in homes or under bark, crawl under piles of leaves or other debris, or burrow into soil or under the edges of sidewalks. All these places are warmer in the winter that the outdoor air temperature. Carpenter ants and many other pests produce glycerol in their bodies, a type of natural anti-freeze that allows them to survive even freezing temperatures. Ants also simply move their colonies deeper into the ground where it's warmer on colder days. Some insects go into a state of diapause (an almost complete shut-down of their body functions) as winter begins. In this condition they are able to survive low temperatures that would normally kill them. Some pest spend winter in certain weather resistant life stages, which for most insects is the egg or pupa. These stages survive weather extremes that would easily kill the larva or adult. Pest that spend their entire life indoors, like cockroaches, fabric, and stored pests, often continue eating and reproducing all winter. If the temperatyre inside is very low they just become less active, and may stop reproducing until it warms up a little. Sometimes very soon winged termites will start taking to the air to mate and start a new colonies. Hundreds of these "swarmers" can emerge from a single mature termite colony. Being alert and watching for winged termites is important-it is both evidence that one or more established colonies are in the area, and a warning that they are trying to create new colonies. Swarmers are weak fliers and most stay within a block or two of where they emerged. A few may find their way back indoors, but if you see many winged termites indoors it is a sign that they are probably coming from a colony that is already inside your home and eating away at it. We're including a picture here of both a termite and an ant swarmer, because ants may swarm about the same time as termites, and it is easy to mistake the two. 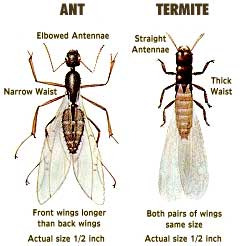 Note that unlike ants, termite front and rear wings are about the same length, the wings have lots of veins, their waist is broad, and their antennae are curved or straight, never sharply bent. Proper identification is important, because the control techniques we use for termites, carpenter ants, and other ants are very different. Call us for a professional inspection if you find any of these pests in or near your home. Save some of the pests for us in a jar for proper identification, but please don't fill the jar with water-it rots the insects. Whatever the pest, we will design the best control strategy to eliminate them and protect your home. A new species of cockroach has been discovered in New York that can tolerate very cold temperatures. An infestation of the Japanese cockroach, also called the Yamato cockroach, was recently discovered in the High Line. This popular new destination park in Manhattan has become famous because it is built on an old elevated railway. Large pockets of Japanese cockroaches were found under removable boardwalk sections in the walking paths, as well as under other man made objects, and among the ornamental plants. The japanese species is also found in China and Korea. What is notable is that it not only thrives indoors where it is warm, but it has an unusual resistance to cold weather, allowing it to survive outdoors even in freeing temperatures. This is very different that the American cockroach, a common related species that has no cold tolerance so it can't survive outdoors during cold weather. Just what we need-a larger tougher cockroach! At the time that this cockroach is most likely spreading in New York City, another cockroach, the Turkistan cockroach, is becoming more common throughout the southwest and into west Texas, and has been found in the south bell as well. This cockroach, originally from central Asia, was first reported in 1978 at an army base in California. It is available for purchase on the internet as food for reptiles, which may be one of the reasons it seems to be spreading by leaps and bounds. The Turkistan cockroach has been replacing the common Oriental cockroach wherever it is found-breeds faster, produces larger broods, and starts breeding at a younger age that the oriental cockroach. Because of this, the Turkistan cockroach has the potential to become a much more serious pest problem. Here in North Hollywood, I have already started to see these pest as samples for identification. A massive recall of 870,000 2012 and 2013 Toyota Camrys, Venzas, and Avalons are all because of spiders. Spiders on occasion have blocked air conditioning drainage tubes on these cars. When this happens, water can drip down onto an airbag control module, causing a short which results in an airbag malfunction-the airbags may suddenly inflate for no apparent reason. There have also been cases when apparently the airbags didn't inflate when they should have, and at other times warning lights have gone on. While so far these spider-caused problems have been unusual, the situation is serious enough that Toyota is making the recall. Toyotas aren't the only car to have serious spider-caused problems. You may recall that spiders caused a huge recall of Mazdas in 2011. In that case, spiders were building nests inside hoses attached to the fuel system, blocking the vent lines for the gas tank. I've had my own personal issues with spiders building webs inside my motorhome gas lines for the refrigerator, which blocked propane from flowing for the pilot light.